Velux blinds add an extra layer of comfort and light control to your Velux Skylight. All Velux blinds come in white and are tailor-made to fit perfectly to each size skylight or roof window. They come with a three year warranty. 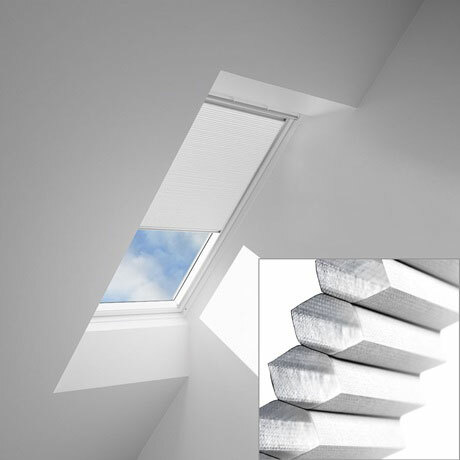 Aluminium side channels allow you to stop the Velux blind in any position. This leaves you with as much or as little light as you want. You have the option of a Velux Blockout blind or a Velux Honeycomb blind. Velux Blockout blinds reduce light by 100% and heat by around 40%. They come in white only and are available in manual, electric and solar powered versions. As the name implies, Velux Honeycomb blinds have a honeycomb structure to the fabric that creates insulated air pockets. These blinds reduce light by 95% and heat by around 60%. Manual and solar powered options are available. Solar powered blinds include a wireless wall-mounted keypad. Unfortunately, blinds are not available for Velux FCM flat roof skylights. 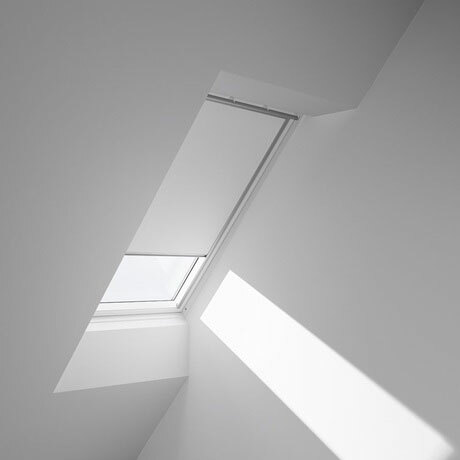 Are you thinking of having a manual blind for your Velux fixed skylight (FS models)? You will need to add a control rod if the skylight is not within your reach. Roofrite can install your blind for you or you can DIY.